Bootie LA – HALLOWEEN BOOOOTIE! Los Angeles Bootie LA – HALLOWEEN BOOOOTIE! It's the spookiest, scariest Bootie LA ever! It's Halloween Booootie! We've got a Midnight Costume Contest, where we're giving away $200 First Prizes (and a trick-or-treat goody bag) for each of the best costumes in three categories: Best Overall Costume, Best Group Costume, and Best Mashup Costume. Plus, free Halloween Booootie CDs for the first 200 people in costume! Free Bootie mashup CDs to the first 200 people through the door! It’s the spookiest, scariest Bootie LA ever! It’s Halloween Booootie! We’ve got a Midnight Costume Contest, where we’re giving away $200 First Prizes (and a trick-or-treat goody bag) for each of the best costumes in three categories: Best Overall Costume, Best Group Costume, and Best Mashup Costume. Plus, it’s Freddy vs. Jason, as Bootie Seattle’s DJ Freddy, King of Pants battle LA’s own DJ ShyBoy on the decks. 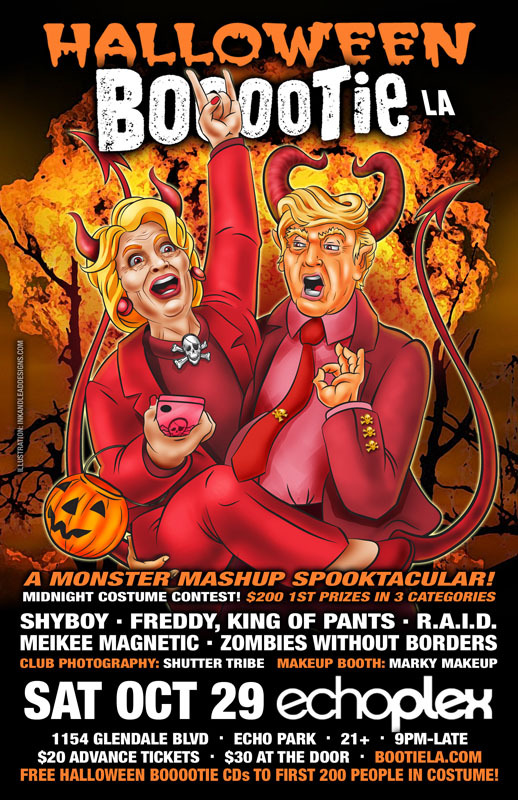 Joining them will be special guest Meikee Magnetic from San Francisco, as they throw some Halloween bootlegs into the mix, making sure the night is a monster mashup spooktacular, filled with tricks and treats and spooky surprises throughout the night! Zombies Without Borders has a special performance, while Bootie LA’s resident dance crew R.A.I.D. (Random Acts of Irreverent Dance) will be on hand for an extra spooky Midnight Mashup Show, as well as go-go shenanigans inspired by the season, and of course, Shutter Tribe will be in the house with their Halloween Photo Booth, ready to capture everyone in their costumed glory! All this, plus free Halloween Booootie CDs to the first 200 people in costume!